I just started reading the Pink Eyes Ebook and I am blown away by the quality. I also have an unofficial ebook version of the original Fallout Equestria, and while the story is good, it lacks the little things that the official ebook of Pink Eyes and the two printings have (I own a copy of the second printing of Fallout Equestria for comparison). Is such a project in the pipeline? Are you looking for volunteers? I, for one, think it would be great to have an ebook version of the same quality as the Pink Eyes ebook or the FO:E printings. 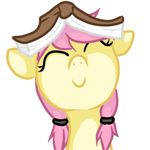 Re: "Official" Ebook for Fallout Equestria? Many thanks again to djazz for working on the Pink Eyes ebook. That's fair. I really hope that's in the pipeline, though. A lot of love goes into that design and it shows. DrDoctor wrote: I just started reading the Pink Eyes Ebook and I am blown away by the quality. You're welcome! I hope we get to see your talent again. i downloaded the EBook what can i open it with? I use Calibre on PC and Moon+ on Android.